is NOT an image of the landscape of Mars? 1- Cydonia face: positive: sculpture, realism evident in several confirmations, details corresponding to a human face, lack of background noise or interference, proximity to other possible artifacts or structures, peer reviewed papers demonstrating artificiality, passed conclusive a priori tests for artificiality; negative: one side of face severely damaged; has been designated a natural formation by NASA. E0300824, E2001532, Cydonia Face, first noted by T. Owen, 1976; disc., V. DiPietro and G. Molenaar, 1978; 9.76°W, 41.14°N, 1.63 m/p (E20), ~1.85 km wide (full face); first artificial structure found on Mars. SP122003, E1701041, and ESA Images of Cydonia Face. 2- Cavebear: positive: photographic realism, good shading, one confirmation at higher resolution, proximity to other possible artifacts or structures; negative: some background noise, apparent flat art (giving all such objects a lower probability for artificiality than would a three dimensional sculpture), limited detail. 3- Clown: positive: realism in two confirmation images, extensive detail corresponding to a human face, proximity to other possible artifacts or structures; negative: extensive background noise, unfamiliar art style of mosaic, apparent flat art. E1002357, Clown, 2006; 76.02°W, 4.68°S, ~670 m wide, 3.01 m/p, emission angle of 17.95° accounts for appearance variance from previous. 4- Nefertiti Profile Image: positive: da Vinci style art, detail conforming to human face, good shading, two confirming images, proximity to other possible artifacts or structures, peer reviewed paper demonstrating artificiality; negative: background noise, limited detail due to medium resolution of images, apparent flat art. 5- Curiosity: positive: high degree of bilateral symmetry corresponding to a human face, bilateral eye detail, sculpture; negative: medium to poor resolution of image, no confirmation images, excessive background noise. 6- Saint: positive: classic stained glass style art, good detail and proportionality conforming to that style, proximity to other possible artifacts or structures; negative: extensive background noise, medium resolution, no confirmation images, apparent flat art. 7- Parrot: positive: detail and structure conforming to a familiar domestic animal (parrot), sculpture, proximity to other possible artifacts or structures, one confirming image; negative: can be explained as geological formation. M1402185, Parrot, disc., W. Faust, 2002; 55.30°W, 48.07°S, ~2 km wide, 2.77 m/p, West Argyre rim region, adjacent to Parrotopia (not shown) , note mid-body of Parrot is raised mound. 8- Easter Island Man: positive: statue, two confirming images, similarity to familiar terrestrial art, no background noise; negative: poor image resolution, limited detail. http://www.msss.com/moc_gallery/e01_e06/images/E03/E0302550.htmlE2100825, R0300585, Easter Island Man. Note shadow on E21, indicating object is raised from ground level. 9- Aladdin and Jinn: positive: realistic art, good shading, good detail and proportions corresponding to human faces; negative: apparent flat art, no confirming images, medium resolution, strange or alien apparent theme, excessive background noise. 10- Crownface: positive: realistic portrayal of handsome human face; negative: features or part of face missing or damaged, no confirming images, part of strange mosaic, face is north/south inverted within larger face, flat art, background noise. M0203051, Crownface, Greg Orme, 2001; 275.52°W, 2.66°N, ~500 m wide; 5.78 m/p, inverted, south oriented (SO) smaller face within large NO face. 11- Barbara: positive: realistic, detailed human face, good shading, one confirming image; negative: large face over 2 km wide; details partially damaged or missing, Crownface is strangely inverted inside hair of large face, flat art, excessive background noise. 12- Guardian: positive: face etched out of cliff or embankment, fair detail, part of Parrotopia mosaic; negative: large face, unlikely appearance of baby face, can be explained as natural formation. S1800106, Profile with outreached Hands, 2006; 48.28°E, 27.98°N, ~625 m wide, 3.25 m/p. 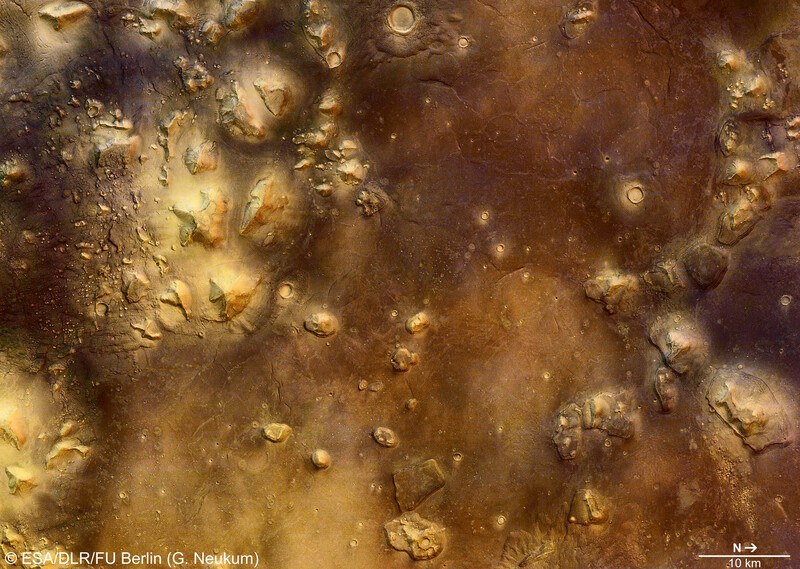 Located in a small crater just north of the Flammarion crater. Are you ready for the Correct Answer? Which of the above images is not a real Mars image? The images posted above were created by Neil DeRosa. They are not in the public domain, but are protected by copyright. Please contact Rich DeRosa through the Meta Research forum if you wish to obtain permission to use them. Thank you Rich DeRosa and Tom DeRosa for allowing me to preserve Neil's images on this website!